Spherical Plain Bearing COM.T Series is a classification of bearings and is used in a wide range of applications. It is a spherical plain bearing that can rotate arbitrarily during movement. 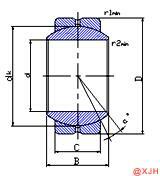 It is a spherical contact surface between an internal bearing and an external bearing. It is made in a variety of processes and has many advantages. The outer ring of the Spherical Plain Bearing COM.T Series is tightly fitted with the housing bore, and the inner ring and the shaft are loosely fitted. The joint bearing can be pressed into the housing first, and the outer diameter of the fitting sleeve should be slightly smaller than the diameter of the housing hole. Spherical Plain Bearing COM.T Series inner ring and shaft, outer ring and housing hole are tight fit. The end face of the assembly sleeve shall be made into a ring that can simultaneously press the end face of the inner ring of the joint bearing, or a disc and an assembly sleeve are used to transmit the pressure to the inner and outer rings at the same time, and the joint bearing is pressed into the shaft and the casing.